Carlos Marcello was a Mafia boss who presented himself as a tomato salesman. He lived in Metairie and died in 1993. The heuristics is straightforward: Someone that wants to “buy a spot in the line” is willing to pay more than existing market participants for that spot. Excuse me while I take another lap…. And yes Virginia, there are financial side to the stories to the privatization of the 2 taxpayer funded Jefferson Parish Hospitals that everyone in the media has been made aware and you’ll only see it one place and that is right here on Slabbed. Let’s start with Jefferson Parish Councilman Chris Roberts and the money he makes from West Jefferson Medical Center. 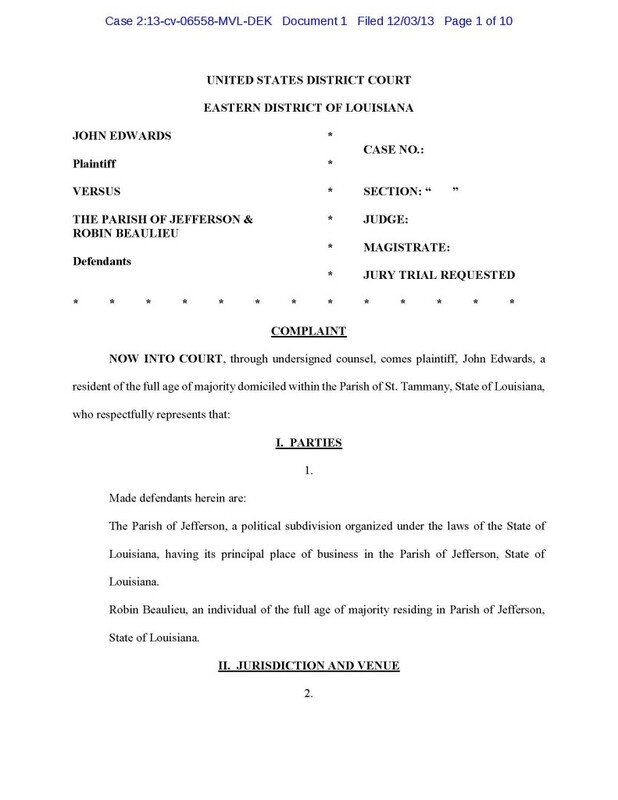 Step one: Obtain latest Chris Roberts ethics filing, which Roberts finally and belatedly filed with the Louisiana Ethics Administration (hint to the gang in Baton Rouge the extended deadlines for filing income taxes passed in October and November). Note that Roberts still owns the a portion of the West Bank Beacon. Step two: Play some lovely music. Tuesday Open: Stick a fork in it! File this one under canceled. It was that bad and that is saying something for reality TeeVee, which is generally bad. From the Jefferson Parish Hospital front Parish Councilman Chris Robert’s, despite being sued personally for defaulting on his business loans is suddenly a hospital financial expert. The bottom line is HCA will pay property taxes while Children’s will not so this latest bit of BS from Team Children’s is how much over zero will HCA benefit the Parish via payment of property taxes. Feel free to add your own links in comments. Author Douglas HandshoePosted on November 12, 2013 March 13, 2014 Categories SopTags Childrens Hospital, East Jefferson General Hospital, Edwin Edwards, HCA, Jefferson Parish Councilman Chris Roberts, USA v Bill Walker et al, USA v Scott Walker and Michael Janus, West Jefferson Medical Center7 Comments on Tuesday Open: Stick a fork in it! Jackson and Spears are conprofit associates from way back folks.